Davos – the alpine venue of the annual meeting of global business leaders and the world’s leading politicians – has traditionally sought to promote values of open economies, free trade, multilateral institutions and international cooperation on security or social issues. 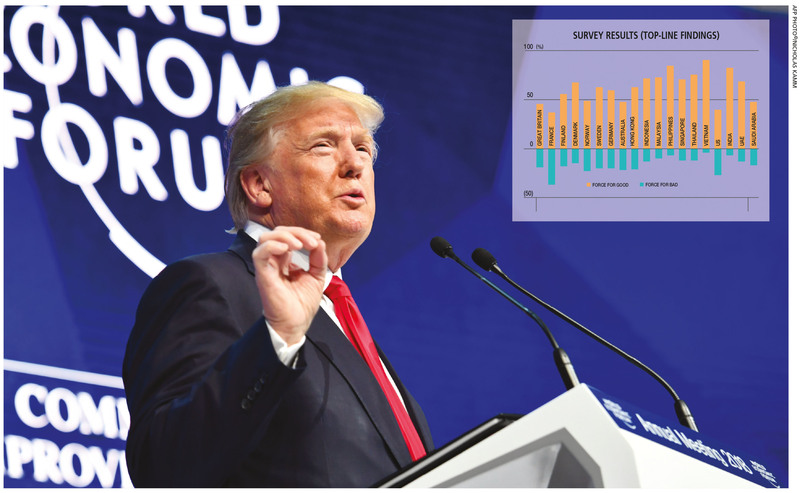 This year, it was dominated by controversy over the Trump administration’s support for a weaker dollar to boost US exports, its more protectionist stance on trade and the danger it posed to the liberal world order. President Donald Trump’s ‘America First’ agenda questions the notion of mutual interests and instead tends to view globalisation and multilateralism as zero-sum games. In response, several leaders have expressed the need to continue cooperation and mutual engagement while warning against what German Chancellor Angela Merkel called ‘national egotism’ and ‘protectionism.’ French President Emmanuel Macron made an impassioned speech on similar topics. Collectively, the leaders of France, Germany and Italy signalled that Europe – only a year ago dismissed as a crippled economic realm fraught with political recrimination – has regained force. China, through its senior official Liu He, has insisted on the benefits of globalisation. After several years during which the mood at the meeting was portrayed as gloomy, this year’s forum opened with the IMF’s most recent global outlook hailing the “broadest synchronised global growth upsurge since 2010.” All signs point to a further strengthening of global growth in 2018 and 2019, according to the IMF, which upgraded its global growth forecasts for 2017, 2018 and 2019 on the back of a better growth outlook in the US and Eurozone. This revision reflects increased global growth momentum and the expected impact of the recently approved US tax policy changes. The IMF raised its US growth forecast to 2.7 percent from 2.3 percent for 2018, and upgraded the 2019 US forecast by 0.6 percentage points (pps) to 2.5 percent to incorporate the projected effects of the tax bill passed in Congress in December 2017. The lending body revised its Eurozone growth predictions higher by 0.3 pps to 2.2 percent in 2018 and two percent in 2019. Among the reasons for this are encouraging data, improving confidence and signs that the recovery is self-sustaining. It downgraded its UK growth forecast for 2019 by 0.1 pps (to 1.5%) due to Brexit uncertainty. Asia continues to be the fastest growing region with China and India being the main drivers of growth. It continues to account for over half of global growth. The IMF perceives threats such as rising inequality, and higher inflation and interest rates, to the sustainability of the upswing. Its chief economist warns that complacency is the overarching risk for the global economy. Trump’s speech was closely scrutinised for hints of more protectionist moves at a time when many are concerned about escalating trade friction with China, ongoing NAFTA negotiations and Europe contemplating filing a complaint with the WTO on the US tax reform bill, which it believes represents implicit export subsidies. Interestingly, Trump has opened the door to the US rejoining the Trans-Pacific Partnership (TPP) a year after withdrawing from it. The TPP, which the Obama administration spent years negotiating with 11 other countries in the Asia-Pacific region, was one of the main economic priorities constructed as a long-term strategic response to the rise of China. On a positive note, led by Japan, the remaining countries in the TPP reached an agreement at Davos and are likely to sign the deal on 8 March while leaving the door open for the United States to rejoin someday. Trump has indicated that the US would prefer to form bilateral agreements with TPP countries and other trading partners. However, the Trump administration has had little success in commencing such negotiations with Japan and Vietnam declining invitations to begin talks. Trump stated that the US would seek much deeper renegotiation of the TPP if it was to rejoin, pointing to efforts to rewrite NAFTA with Canada and Mexico. The US president also pointed to rising stock prices at the time, improving consumer and business confidence, and jobs growth. GDP growth since he took office however, is similar to that of previous years. In fact, GDP growth figures released after Trump’s speech indicated the US economy growing by a weaker than expected 2.6 percent during the last quarter of 2017. Onlookers say Trump’s move to reopen the door to the TPP and his administration’s efforts to sell its ‘America First’ policy at Davos point to his unwillingness to cede the global stage to China’s President Xi Jinping. Last year, Xi delivered a pro globalisation speech that was the antithesis of Trump’s protectionist stance.